MASS resistance against Western occupation is increasing in Afghanistan, nearly ten years after the US-led invasion. 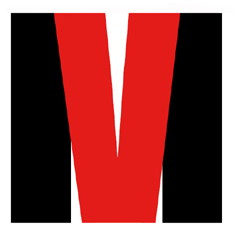 The Voice of America website admits that at least nine people were killed in southern Afghanistan on Saturday in a second day of protests. The catalyst for the latest uprising has been a Quran burning by a right-wing Christian church in the United States. 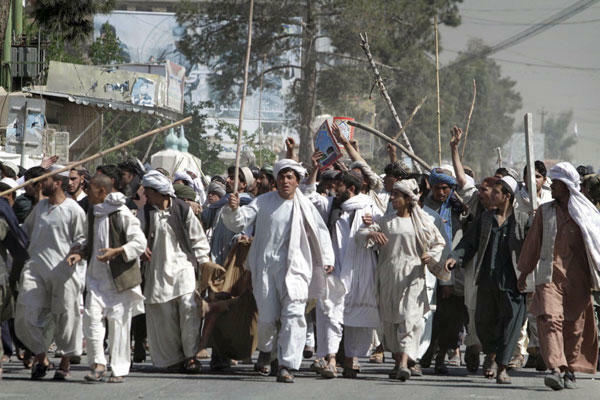 Says the report: "Security forces fired shots to disperse an angry group of protesters as they marched through the streets of Kandahar city, setting cars and buildings on fire. 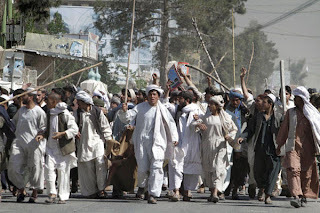 "The riot in Kandahar came a day after protesters stormed the United Nations complex in the northern city of Mazar-i-Sharif, killing seven foreign workers, following a demonstration against the Quran burning. "Also Saturday, NATO officials say insurgents wearing women's clothing attacked a coalition base in Kabul. "NATO says three militants - two of them suicide bombers - were killed when they attacked Camp Phoenix in the Afghan capital. Three NATO service members were slightly wounded."